Preparing college applications is an arduous and stressful process. Taking tests, writing essays and seeking letters of recommendation require months of preparation. Some students choose to apply early (early decision and/or early action) and may be rewarded with a decision of early admittance to a school of their top choice. If your student applied early that news is being delivered any day now. Unfortunately, even for many of the most talented students, the news from admissions officers may be one of deferral. What exactly is deferral and what is the best way to mange one? The admissions committee’s mandate is to put together a talented group of motivated and highly diverse young people who will contribute to campus life and ultimately be successful graduates. When deciding upon early applicants, the admissions committee has yet to see the larger, regular decision, applicant pool. Aside from a number of stand-out applicants who do receive early admission, a number of suitable candidates may be deferred so that the admissions committee can consider them in light of the total applicant pool. When a student is deferred, he or she will receive an “admit” or “deny” decision at the same time as regular decision applicants. • If you have not interviewed, now is the time to do it…preferably on campus. Make sure you practice your interview skills and familiarize yourself with questions that might be expected with a seasoned interviewer until you are confident that your skills are strong. • If you can, visit the campus…again. • Attend an information session, often given by a member of the admissions committee and ask questions such as, “What percent of students are typically admitted after being deferred?” and “Is there anything I can do that might increase my chances of gaining admission?” Not only will this earmark you as a deferred candidate, but the information session speaker may note your visit and strong school interest in your application file. When you application is reevaluated, that interest will shine through. Since schools are more inclined to extend offers to students they believe will accept admission, this is critical. • Without becoming a nuisance, keep the admissions committee abreast of any new accomplishments on a regular basis. • Ask someone who has not read your application to read it and offer constructive criticism. Doing so will give you a fresh perspective on what’s working or not working in your application. Perhaps, unknowingly, you gave the wrong impression or neglected to include something important. Not only will you hopefully be able to “fix it” by sending the school some clarification, but you may also be able to head off a similar miscommunication at another school. Given the competitive nature of college admissions, it is smart to research and apply regular decision to other schools (hopefully you have this list and have been working on these applications all along). While a deferral is far from ideal, it can, if properly managed, still lead to admission. “For students that have been deferred, they can contact the school and ask if they can send in additional information to be reveiwed as part of the regular decision process. If so, they should consider highlighting any new academic or extracurricular achievements, submit an additional letter of recommendation, and 1st quarter grades. In whatever they write, they should make sure to clearly articulate what makes the school so special and how they will contribute to the school community. 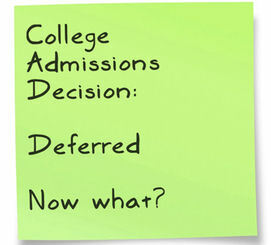 By Stephanie Klein Wassink, founder of AdmissionsCheckup.com, a network of former admissions officers, who can review your application and give you a fresh perspective on why you were deferred/wait listed. Stephanie Klein Wassink, a long-time college consultant and former admissions officer, is founder of Winning Applications and AdmissionsCheckup.com.